Synopsis – The night is just beginning for two low-class hoods as they leave a dive bar. On the way out of the door one of them, named ‘Jimmy’, runs into a cop who recognizes him. They quickly put on an act for the second hood, but it’s pretty obvious that Jimmy is an undercover cop and the other detective didn’t know that. Jimmy drives the other hood home, worried that his cover may have been blown the whole time. A few hours later, a neighbour walks over to the house the hood was dropped off at, planning to complain about the music being up way too loud. Instead, she finds the front doorknob covered in blood, and gets knocked over by Jimmy as he runs out of the house, pointedly not covered in blood. The next day the team arrives at the house, confused as to why they’ve been called in on such a routine bloody mess. It seems that the second hood lived with his parents, and that the two of them were brutally slaughtered, with the wife killed quickly and the husband was brutally tortured. This leads them to blather for a while about the characteristics of torture killers vis a vis organized/disorganized killers, but it’s all pretty unimportant stuff. 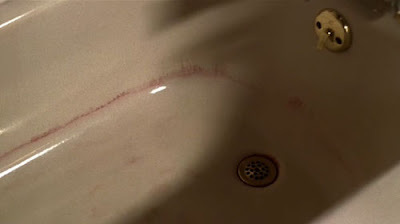 Mandy find what he thinks is an important clue when he notices that there was probably a third victim, based on the level of the bloody ring in the tub. Back to it – here’s the biggest problem with the whole observation: let’s say you’re the killer, and you want to stuff a body into a tub and then dismember it. Why did you put the plug in the tub, allowing a pool of blood to rise? Wouldn’t that be excessively messy, having blood splashing around everywhere while you’re trying to cut up the body? There’s a drain right there, why aren’t you using it? Since you’re inevitably going to turn on the water to clean off the body for transit (can’t have a body bag dripping blood everywhere), why was the plug in at any point? At least they can’t suspect Jimmy, who was clearly not carrying a bag of flesh when he ran out of the house. This situation also raises the question of how blood got all over the front doorknob. The killer clearly washed up a little while he was packing away the corpse, why would his hands be bload-soaked when he was leaving. Also, if you’re leaving a house where you’ve killed three people and are carrying one of their bodies in a duffel bag, why are you using the front door? I’m going on the record right now as predicting that none of these questions will be answered when the credits roll. Back from the credits, the team is wondering what the torture can tell them about the case. Reed (apparently that’s the geek’s name. Who knew?) points out that there are two types of torture, functional (“Like the military tactic” says Greg. Thanks for reinforcing the idea that it’s permissible for the military to torture there, pal) or sadistic. They think it can’t be sadistic, because those guys are always sexual deviants, and the corpses weren’t molested. Greg point out that they don’t have the third corpse, so the killer could have easily sexually violated hood#2 before dismembering his corpse. It’s possible that this isn’t a show whose subject matter is really appropriate for network television. Oh, and the reporters outside announce that they’re looking for a suspect matching Jimmy’s description. Which freaks Jimmy out, leading him to call his handler and set up a meeting for that night. Rather hilariously, Mandy points out that there’s nothing more they can do until they find out who the third victim was. There must be a connection to the killer, or why else would he dispose of the body? Uh, well, if he was that concerned about concealing the victim’s identity, he probably wouldn’t have killed the guy in his own home. He also may have avoided killing the man’s mother and father. Yet Mandy acts like they have no idea who the third dead person could possibly be. In one smart move, he acknowledges that there just isn’t much torture going on in serial killing these days, and has their computer girl look for similar cases in the general area. In an alley that night, a homeless man finds hood#2’s severed head, and it turns out that it was the nephew of the dead couple. Again, this shouldn’t have been hard to find out without the corpse. The team decides that the killer must have been a professional murderer, because he didn’t molest any of the corpses. He was, however, the kind of guy who loves torture. Oh, and if you’re looking for a connection, put the fact that the guy was a mobster together with the fact that you’re assuming that you’re dealing with a professional killer, and announce that it was a mob hit. The team takes a tiny step in that direction when they meet the hood’s shady boss at the scrap metal yard he owns. The boss is played by Sayed Ali, the evil terrorist mastermind from season 2 of 24. Now playing an Italian mobster. Now that’s range! They have a generic FBI/Mob conversation, making vague accusations that they can’t possibly back up. It’s not particularly effective. Back at the computer lab they go through a listing of the victim’s known associates, and turn up a guy with a clearly artificial rap sheet. They knock down his door and discover that he lives a spartan life, which is incredibly suspicious. For an undercover FBI agent, he doesn’t know much about establishing a persona. They quickly discover evidence that Jimmy’s an undercover cop, figuring out what the audience did five seconds into the episode. Unluckily for Jimmy, by the time his handlers arrive to pick him up he’s already been abducted by the killer. Well, let’s see… the murders were 36 hours ago. He’s been missing for 12 hours. So I’m going to guess… after. But I’m not a profiler, so maybe I’m all backwards about this thing. Also, why is Mandy acting like Jimmy is still a suspect? We’re nearing the halfway point of the episode, so it’s time for a chilling mid-point reveal. It turns out that, going back fifteen years, there are at least a hundred unsolved torture-intensive victims. They may be hunting the worst serial killer in the history of America… one that just happens to be working as a mob hitman! Greg and Black Guy head over to Ali’s socail club and break the news that he’s got a freaky serial killer working for him, and not an incredibly professional and effictive assassin. The plan? Listen to Ali’s phone calls and follow him around, hoping that he’ll contact the killer. Despite the fact that he knows that the FBI are after him, he calls the torturer from his office phone, allowing them to identify him as one ‘Vinnie’ as Ali calls him in for a meeting. Armed with the torturer’s name, they go through a listing of Ali’s associates named Vincent. In a funny note, Ali is crimially associated to 11 Vinnies. They identify the killer quickly enough, but he’s been living off the grid since he became an adult, so there’s no good way to track him down. Meanwhile over at Ali’s office, the FBI are getting ready to arrest Vinnie when he shows up for the meeting. How do you think they might do this? What’s the sensible option? Hanging out in their vans, continuing surveilance on the office, then swooping in and arresting everyone once they’re all in one room together, talking with their guards down? Yeah, that probably would have worked. Instead, even though they have no idea whether Vinnie is actually at the scrap yard yet, they go sneaking through its aisles with their guns drawn, hunting a man who may not even be there. Ah, the FBI, can you never catch a break? Greg gets brutally beaten by Vinnie, but he’s rescued by the FBI before any real damage is done. Vinnie shocked and thrown into a van where he’ll be no more trouble for anyone. That wrapped up quickly, didn’t it? Oh, wait, there’s the matter of the kidnapped FBI agent. I suppose this is the part where, Cracker-style, Mandy will have to convince the world’s worst serial killer to give up Jimmy’s location. Given the show’s inability up until this point to convincingly write psychology, somehow I doubt that’s where they’re going to go. Bets are hedged immediately as the team starts examining the contents of his serial killer van. Here’s another question they won’t answer – how did Vinnie know where Jimmy was going to be picked up by his handlers, and how did he sneak up on and abduct a man who was desperately worried about being killed by the mob, and looking over his shoulder every other second? Mandy spends the next scene trying to get into Vinnie’s head, but his attempts to do so are hampered by the FBI agent running in and announcing that he’ll kill Vinnie if he doesn’t reveal where Jimmy is being hidden. This ruins the angle Mandy was working, thereby saving the writers from actually having to write a scene where Mandy successfully psychologically breaks a person down. So, two birds, right? Over at the evidence lab, geek girl and Reed are looking through the evidence in the van, which turns out to contain videotapes of Vinnie torturing people. Why would he keep these in his van? He didn’t have a camera or any way to watch them in there. The camera is set up in the torture chanmber so it can record Jimmy being eaten alive by rats. Just when I think the show can’t get any more inappropriate for network television. Now that he’s shut down, they try to figure out where Vinnie’s torture chamber could possibly be. They don’t know where to start, so they go back to the initial crime. Trying to figure out why he was so sloppy in getting rid of the dead body from the beginning. Of course, since they’ve found a hundred tortured corpses from the last fifteen years, the question becomes ‘why did he just start dismembering corpses now’? While Greg tries his hand at Cracker-ing Vinnie, the team finds the sound of an airplane on one of the tapes, and guesses that he lives near the place where he orders pizza. Vinnie finally admits to having been beaten by his father, and a quick property search in the father’s name reveals that he still owns a house, thirty years after his death. The FBI drives over, and rescues Jimmy before the rats have a chance to do any real damage. The episode ends with Greg oddly trying to comfort Vinnie about all the murdering, explaining that abuse victims sometimes turn into serial killers, so it’s not really his fault. Greg also admits that his own father beat him, which provided him the impetus to become a crime-solving machine. Aw… it’s like they’re two sides of the same coin. How deep. Good lord, no. While the show has been extremely light on profiling up until this point, a new low bar has been set. While they were able to predict the kind of criminal they were looking for, and the insight into his personality lets the team know that he’s obessed with killing his father over and over again, but even that isn’t useful. The idea is that he was caught because he was so sloppy in getting rid of the body at the beginning, because he was so freaked out by being forced to kill a woman that he stopped being professional. Of course, this theory is predicated on a couple of crazy laps. First off, there’s the fact that in every other case, he’s shown to be a professional who plans carefully and then kills his target ‘cleanly’, then leaves the body somewhere. So even before he was so ‘freaked out’ by having to kill a woman, why did he attack this target in a private home full of people that he wasn’t supposed to murder? One might say he’s escalating, but given that he’s been doing this for like twenty years without a change in MO, why the change now? Secondly, it’s still not clear why he tried to get rid of the body at all. That’s unambiguously not part of his MO – they know he’s a prolific serial killer because he leaves so many tortured corpses just lying around for the police to find. It was entirely conventional police methods that solved the crime. First off, there was the old trick of going to Ali and telling him that his hitman was crazy, hoping that they’d set up a meeting. Ali, being an incredibly stupid mob boss, then sets up that meeting within earshot (well, listening device earshot, anyhow) of the Feds, allowing them to make their capture. The fourth-act reveal of Vinnie’s father’s house is supposed to play like profiling was involved – it’s only after he mentions to Greg how much he hates his dad that Mandy announces that he’d still live in his father’s house. It plays more like bad writing than good psychology, though, since they identified the killer at the halfway point, and were befuddled by his lack of a listed house. In the episode, this was treated like a frustrating dead end, but I have to imagine that any real police officer would, immediately after learning that his suspect doesn’t have a house, ask the logical next question: “Does his immediate family have any property where he might be staying?” Had they just asked that one, they could have found Jimmy a full twelve hours earlier, and saved the audience some of Mandy’s posturing. 2 – Really bad week for profiling, this one. They managed to figure out all sorts of things about the killer’s personality, but beyond some posturing by Mandy, none of it was useful in tracking the killer down. Remember how I predicted that the show wouldn’t address how Vinnie managed to nab an acutely nervous FBI agent off of a random unknown street corner? It turns out that as the show ended, there were actually a few unanswered questions left. - Why did Ali have Hood #2 killed? - Did the FBI arrest Ali? - Did Ali also send Vinnie after Jimmy, or was he doing that on his own? - If Vinnie went after Jimmy on his own, why did he do that? - How did Vinnie find Jimmy to abduct him? - Why was the episode titled 'Natural Born Killer' if the entire point of Greg's psychological analysis was that it was childhood abuse that turned him into a killer? Was it meant ironically? Bad week on Criminal Minds. Not CSI:Miami bad. But close.